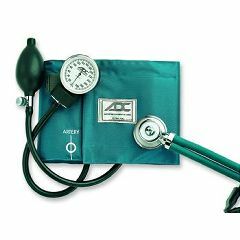 Cuff and stethoscope kit has a color-coordinated professional sphygmomanometer and Sprague-Rappaport-type stethoscope. ADCUFF calibrated nylon cuff with Size Guide and gauge holder pocket features a black enamel 300 mmHg, no-pin stop manometer and nickle plated air release valve. Latex inflation bladder and bulb. Stethoscope can be used with adults, children and infants. Threaded chestpiece has two interchangeable diaphragms and three bells for detection of high-, middle- and low-frequency sounds. Double tubing for acoustic separation. Includes 1 pair of mushroom eartips, 1 pair of rubber eartips, and 10" L x 6" W x 3"D color-coordinated, nylon carrying case. 2-year inflation system warranty and 20-year calibration warranty. Cuff size fits 10.2" -16.1"
Easy Storage. Accurate. Excellent quality. Accurate home monitoring of B/P. Stethoscope is very high quality. Emergency. monitor bp at home. Elderly. Following Surgery. The bp cuff and stethoscope seem to be of pretty good quality.[...] I would definitely buy from them again, and reccommend them to my friends. I've bought several BP cuffs and stethoscopes over the years, but this is the best one I've found. The stethoscope picks up sound better than any others I've used and it's lightweight. The cuff is also light, not bulky, and easy to use. Overall, an excellent product for home use. And I failed to mention, it's not as expensive as others I've purchased.